I've been absolutely obsessed with blood oranges this winter. 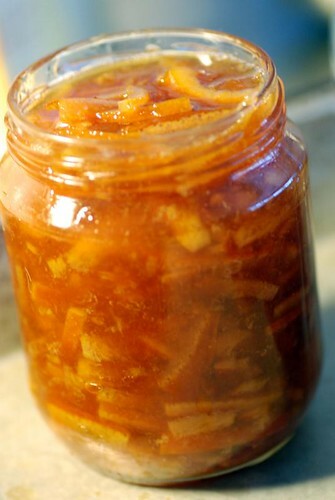 I've eaten a ton, and I also made a few of them into this lovely marmalade. I'm always nervous about canning, but despite that, I always seem to get good results. I admit I chickened out a bit towards the end of the cooking here and added some sugar-with-pectin, but really, I'll skip it next time. I used fairly thick pieces of orange, and all of the rind, which made for a slightly bitter marmalade with a good chew. For smoother, process the orange pieces in a food processor for a short while, and you'll get a different result. So. Recipe? Not really, but a sketch. Blood oranges - as many as you'd like. I used nine. Water. Enough to cover. I used 500 ml, which is the same as 2 cups. Sugar - as much as the water and oranges weigh after cooking. I used 1200 g.
Scrub the oranges very well. Cut off the ends. Quarter, and slice thinly across. Place the orange pieces in a large pot, and add enough water to JUST cover. Cover with a lid, and cook on low heat for 90 minutes. Now, weigh your oranges and water, and add the same amount of sugar. Possibly a bit less, if you feel like that's a very large amount of sugar. (It will be.) My mass weighed about 1300 g, and I used 1200 g of sugar. Bring this to a boil, and cook on low heat without a lid for 60 minutes. Check to see if it's done by taking a cold plate (keep it in the freezer), pour some marmalade on it and see if it gels. If it doesn't, cook a little longer. Try again. When done, pour into clean, sterilized jars. I keep mine in the fridge since I don't really trust my canning, but if you're more confident, I'm sure they'd do well in a pantry, too. Mums, den ska jag prova koka någondag! Mmm, jag älskar blood oranger och blood orange te, jag måste prova på detta. Jag tycker du har en underbar blogg. Hoppas vi kan pratas i framtiden. Ewa i Seattle, WA. Hur mycket marmelad blev det av nio apelsiner? Svårt att säga - 3-4 burkar i varierande storlek. Thanks for sharing your recipe. I love marmalade with croissants! And nothing beats the taste of homemade.